If a tree falls in the forest and no one is around to hear it, does it make a sound? 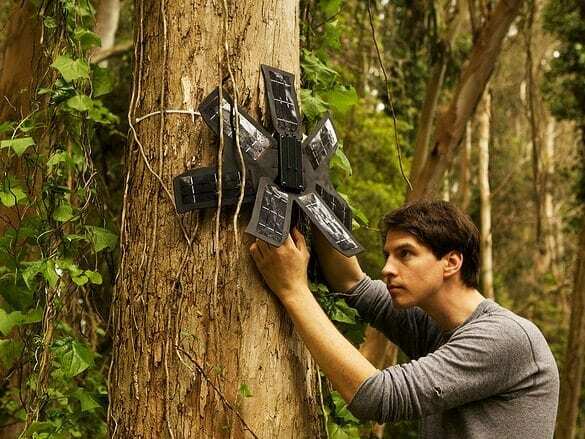 According to Rainforest Connection, the answer to this age-old question is “Yes.” The San Francisco–based startup is working to recycle old smartphones into listening devices that are capable of detecting deforestation and alerting authorities to illegal logging. It’s hard to believe that the solution for deforestation has been hiding in our desk drawers for the past two years. Smartphones are the most advanced and well-understood computers available, and by reusing and modifying old phones we could significantly decrease both the amount of e-waste and the amount of rainforest destroyed. Environment Canada estimates that more than 158,000 tonnes of outdated or broken computers, cellphones and televisions accumulate in Canadian landfills annually. In a world where almost everything is disposable, it’s critical that we work to recycle or repurpose materials and items. This trend is growing within industry, and businesses are learning that it’s not always profitable or environmentally friendly to be wasteful with our own waste. For example, MaRS’ own GreenMantra Technologies turns plastic waste material into high-value refined products such as wax, grease and lubricating oils. Rainforest Connection also works to alter the fate of disposed items. By rerouting old smartphones from the landfill to the rainforest, it’s possible to cut down on e-waste and prevent the cutting down of our forests. Deforestation is not only responsible for catalyzing the extinction of animals and the deterioration of our environment, but it also accounts for 17% of our global carbon emissions. This means that deforestation is the second-largest human-produced source of carbon dioxide emissions, after fossil fuel combustion. In an exotic forest full of predatory animals and poisonous plants, it’s clear that humans are now becoming the most severe threat. After a successful pilot program in the Kalaweit gibbon ape sanctuary in Indonesia, Rainforest Connection took to Kickstarter to raise money to help with manufacturing and creating additional programs around the world. Upcycling mobile devices into solar-powered listening devices enables real-time alerts to be sent as SMS messages through a standard cellular Global System for Mobile Communications network to local authorities. At the core of each device is an Android smartphone with an operating system that has been modified and geared toward resource management, internal analytics and power efficiency. The device has highly sensitive external microphones that can capture ambient sounds, like the sound of chainsaws, enabling immediate intervention. The device can pinpoint the exact location the deforestation is taking place. Read the Rainforest Connection technical summary to learn more about the devices’ hardware, software and web server. Two important factors to consider are the presence and strength of the cellular coverage. When operating in a location as remote as the deep rainforests, is it even possible for a message to be sent? The answer again is “Yes.” A surprising percentage of targeted areas have the infrastructure and networks in place to allow for communication between device and local recipient. However, if the connection becomes too weak or becomes disrupted, the device will still be able to store the data. These connections have the potential to become even stronger with projects operating in this space. Brazil’s National Institute for Space Research is working on a project to launch balloons above isolated locations in an effort to bring access to Internet-transmitting stations. Google is also attempting to expand Internet reach with Project Loon, its very own balloon project, which has been tested extensively in New Zealand. Current detection systems used around the globe rely largely on satellites, which can take up to weeks to report any illegal activity. Unlike the Rainforest Connection devices, which work proactively in real-time, satellites can only detect and map the deforestation after the damage is done. Each Rainforest Connection device installed can prevent 15,000 metric tons of carbon dioxide from being released into the atmosphere. They are installed high in tree canopies and camouflaged from sight, and they can also send alerts notifying first responders or local partners if the device is tampered with or moved. I sat down with Topher White, founder of Rainforest Connection, to talk about his company and future pilot programs. What inspired you to tackle deforestation and to develop Rainforest Connection? I went to Indonesia to help with the rehabilitation of gibbon monkeys. While I was there I learned that protecting the sanctuary was a huge challenge. Half of the sanctuary’s money goes toward security and hiring guards to watch the area to stop illegal logging, but it’s not always effective. One day, while out for a walk only five minutes away from a ranger station we came across people cutting down trees. When you think about it from a technology perspective, it’s relatively easy to pick out chainsaw sounds from a forest using computer software. This was the epiphany moment. After discovering there was connectivity way out in the middle of nowhere and the potential of mobile development, I had an idea. I thought to myself, “What if we use the trash that’s already being thrown away and use the infrastructure that already exists to make it possible for people on the ground to get alerts in real time?” That’s really how it all began. Your company completed a successful Kickstarter campaign, raising more than $167,000 in pledges. What is Rainforest Connection planning on doing with that money? Operating in the middle of nowhere is expensive. The devices themselves are inexpensive, but we’re still working on putting money into research and development. We’re still bootstrapping and planning our next pilots. We’re going to Africa for about three months on the ground setting up 30 devices to cover up to 100 square kilometres of forest to protect elephants and that environment from illegal loggers. The idea is that we already had our pilot in Indonesia and there’s still a lot of work to be done there. Right now, we’re trying to show and prove to others and ourselves that our model can work in diverse cultures of each rainforest. What advice would you give to entrepreneurs who have e-waste or environmental innovations? Don’t build something from scratch if it already exists elsewhere. In this case, I didn’t think I was going to build it out of old smartphones. Initially I thought I would build this special hardware and software. I’ve learned that using pre-existing stuff, such as open-source software and donated phones, is the cheapest and simplest way to do it. The trash that’s lying around is definitely worth something. I would also say that it’s important to solve a problem that is your problem—meaning, you should strive to solve a problem that you’ve experienced. There’s a lot of wisdom in that because it enables you to build a product that you would actually use. Choosing the right problem to tackle is essential. There are a lot of people who believe that waiting 10 minutes for a taxi is a big problem we’re facing. While solving problems like that one is complicated and impressive, there are much more technically easy problems that matter much much more.